Needles and Hooks and Books, Oh My! : Returning with FOs! Been MIA for quite a few days- just got caught up in life, and projects, and wedding stuff. 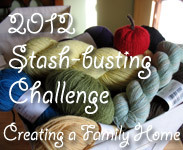 I'm attempting to be more brief, as a way to keep reader and writer engaged and not over-taxed with my chatter. I'll let my pictures do the talking. Baby blanket for nephew Josiah, expected in September. Keeping myself entertained while I crochet! My future mother-in-law asked that the guests pray over me. 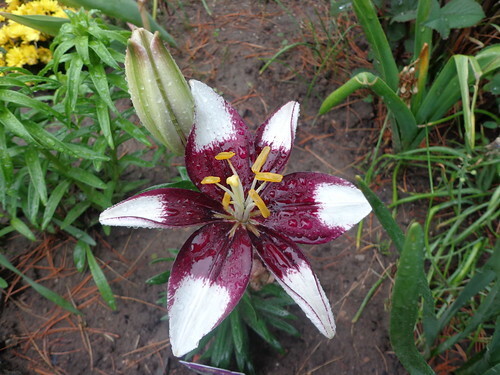 It's been raining a bit here, but some beautiful flowers are out in my mom's garden! So, I've been busy. 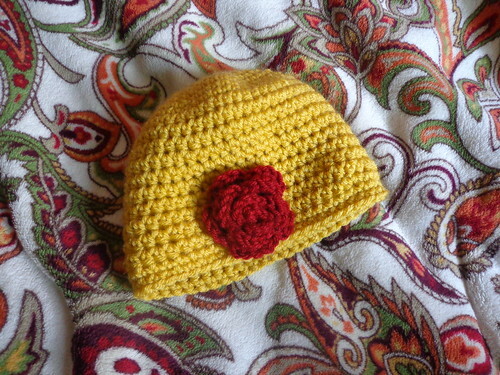 The hats & blanket were finished this last week. 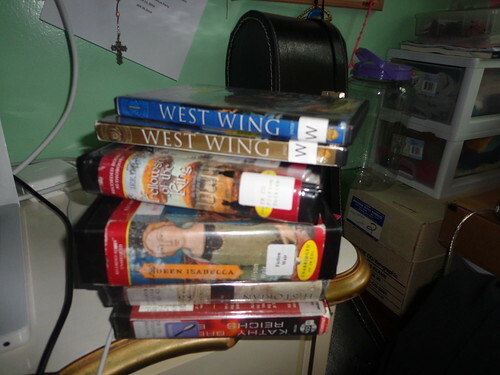 I'm about halfway through the first season of the West Wing. I'm listening to The Fellowship of the Ring again, because I like the reader, and the content is so fun! 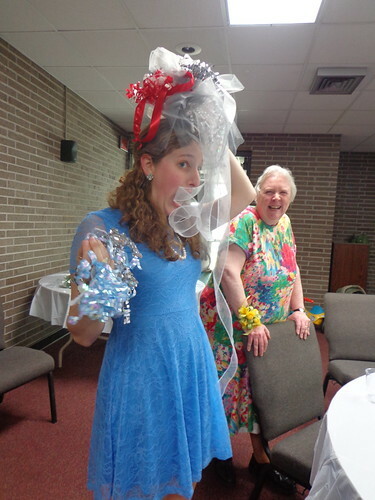 My first bridal shower is done with, and it was a lot of fun-- E's aunt and cousin did most of the work, and the food was amazing. Luckily, I have another month or two before the shower hosted by my sister & aunts. 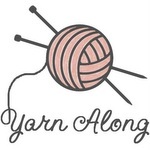 Linking up with Tami's FO Friday!!!! Congrats and good luck!! 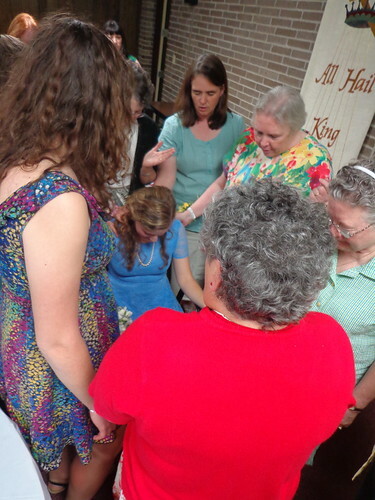 Prayers for a happy wedding and a wonderful marriage. I love love love your bird hats and the afghan! Have a great Memorial Day Weekend. 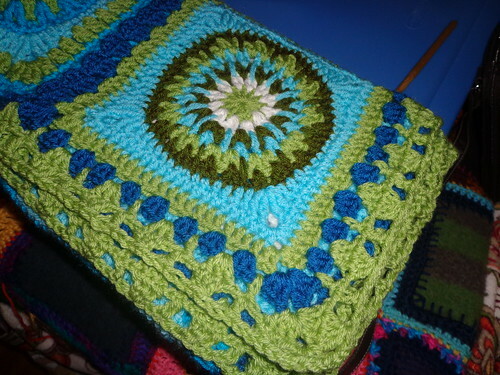 Love the colours in Josiah's blanket :) Enjoy the showers and all the fun before, during and after the big event. It amazes me how people like you get so much done and on top of that you're getting married! Congratulations! Your hats are darling and your colors are so pretty. That picture with the bows is hilarious! 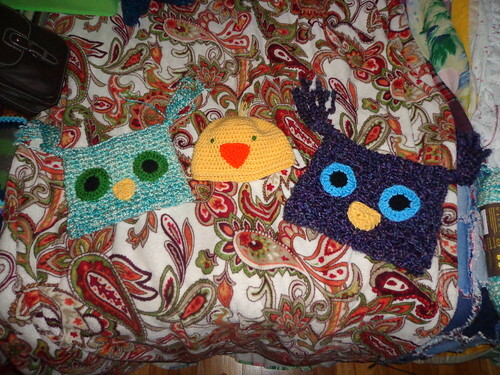 Also, I adore the color scheme you used for the baby blanket and the owl hats are super cute. I love the baby blanket! Looks like the shower was a lot of fun!